Ocean’s Halo Strawberry Coconut will refresh you with hints of strawberry. This delicious, refreshing drink contains deep sea water and extract from ocean kelp, providing a sustainable, nutrients & minerals-dense drink. ~ Contains electrolytes like Calcium Magnesium and Potassium. Filtered water, desalinated deep sea water, organic honey, organic strawberry concentrate, citric acid, organic coconut water concentrate, organic natural strawberry flavor, natural coconut flavor, organic fruit & vegetable juice (for color), kombu (kelp) extract (water, kelp, salt). Ocean’s Halo Passion Guava will transport you to a tropical paradise. This delicious, refreshing drink contains deep sea water and extract from ocean kelp, providing a sustainable, nutrients & minerals-dense drink. 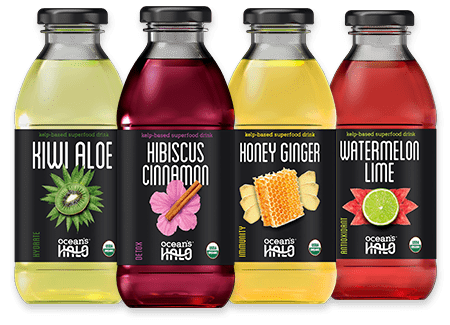 Filtered water, desalinated deep sea water, organic honey, organic passionfruit concentrate, organic fruit & vegetable juice (for color), natural guava flavor, organic natural flavor, citric acid, kombu (kelp) extract (water, kelp, salt). Ocean’s Halo Hibiscus Cinnamon will delight your palate with floral flavor. This delicious, refreshing drink contains deep sea water and extract from ocean kelp, providing a sustainable, nutrients & minerals-dense drink. 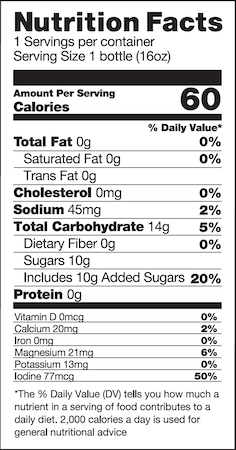 Filtered water, deep sea water, organic honey, organic hibiscus concentrate extract, organic hibiscus flavor, organic fruit and vegetable juice (for color), citric acid, pacific kombu (kelp) extract (water, kelp, salt), organic cassia (cinnamon) extract. Ocean’s Halo Honey Ginger will soothe your taste buds with a sweet flavor. This delicious, refreshing drink contains deep sea water and extract from ocean kelp, providing a sustainable, nutrients & minerals-dense drink. Filtered water, deep sea water, organic honey, organic ginger juice, organic ginger, citric acid, pacific kombu (kelp) extract (water, kelp, salt). Ocean’s Halo Kiwi Aloe will tickle your taste buds with a tart and tasty flavor. This delicious, refreshing drink contains deep sea water and extract from ocean kelp, providing a sustainable, nutrients & minerals-dense drink. Filtered water, deep sea water, organic honey, organic kiwi puree, organic kiwi flavor, citric acid, organic aloe powder, pacific kombu (kelp) extract (water, kelp, salt). Ocean’s Halo Watermelon Lime is bursting with zesty flavor. This delicious, refreshing drink contains deep sea water and extract from ocean kelp, providing a sustainable, nutrients & minerals-dense drink. Filtered water, deep sea water, organic honey, organic watermelon juice concentrate, organic watermelon flavor, organic fruit and vegetable juice (for color), organic lime juice, citric acid, pacific kombu (kelp) extract (water, kelp, salt), organic lime extract.